What will 2011 go down in history for? 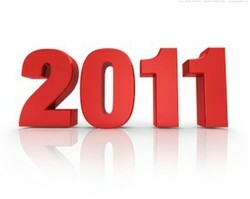 2011 will have been a memorable year to each of us for many reasons but how will history remember it? 2012 The End of Days? 2012 is rapidly approaching. If you believe the Mayan predictions it will be the end of the World as we know it. Let's face it 2011 has hardly been a barrel of laughs for many people around the world. It would be easy to believe that the "End is Nigh" as they say. Still mankind is based on optimism. If it was not people would have given up the ghost many years ago. Before we arrive at New Year's Eve though and welcome 2012, either with open arms or great trepidation, we need to see off 2011. 2011 has been a tumultuous and tremendous year in so many ways but how will it go down in History? Of course there were many more happenings, some of which were very nice, than you very much. In the UK Prince William married Kate Middleton in a Spring wedding which the crowds adored. The new Royal couple then embarked on a succesful tour of Canada followed by a whirlwind visit to the US. All of this was in reality an unecessary expense when you consider what followed but many people like a little pomp and ceremony. Each country would have had its own such special occasions and memories but sadly all will have experienced more negatives in 2011, than positives. Earthquakes, Volcanic Eruptions, Flash Floods, Hurricanes and more. 2011 must be memorable for many people for its horrific weather patterns and natural disasters. The Japanese earthquake and Tsunami shocked the World and almost brought about a nuclear Armageddon. New Zealand sufered a devastating earthquake, Australia severe flooding and the US Hurricane Irene. As the year draws to a close the Philippine Islanders are beginning to bury their dead, from a typhoon and flash flooding. The death toll stands at almost 1,000 now yet there are still people unaccounted for. Sadly there were many other natural disasters in 2011. In December 2010 a young man in Tunisia burned himself to death, in desperation over the corruption and poverty he was experiencing in his own land. His actions would spark a multi country, Midde East, protest which would lead to the fall of many long standing regimes.Civil unrest, deaths, war and the ousting of established leaders followed.Egypt, Tunisia, Libya and more felt the wrath of the people. For some 2011 will end with a more settled future hopefully on the horizon. For some there is still long way to go. For countries such as Bahrain and Syria the death tolls continue to mount but little has been resolved. Both Iraq and Afghanistan are experiencing a gradual withdrawal of foreign troops. This is good news for the troops and their loved ones but it is by no means certain that either country will not revert to past form. The Occupy Protest Movement and More. Such have been World protests in 2011, that Time Magazine's person of the Year was the Protester. From the Arab Spring through the downfall of the old Libyan regime in the Autumn of 2011, protesters have been on the streets of the world. In the US a group of people, fed up with what they termed Corporate Greed, tried to launch a protest against Wall Street and the Stock Market. The idea rapidly spread around the world and there are still some protest camps in various cities. Some appear to be losing ground but that is not to say the movement is over and done with. The UK experienced riots in August 2011 that soon spiralled out of control. There were some deaths plus violent disorder, looting, arson and much destruction. For a time the UK looked like it was doomed. As if all of this was not enough the World is destitute. Many countries are experiencing severe economic gloom and doom.There appears to still be enough moneyt to fund weapons and wars but not enough to pay wages and feed people. The words 2swinging cuts" and "economic restraint" ring out. People are being told they will have to tighten their belts, but for many of them they can tighten them no further. Skimming over the year in this brief way it is still easy to see that 2011 has been an unusual year. Many years offer some surprises and strange events but 2011 seems to have gone from one problem to another. As we all ring out the old year and ring in the new most of us will hope for a better New Year. However with Iran unsettled, and, since the death of Kim Jong-il, Korea wobbling, 2012 could be a whole new ball game. Could it be the End of Days? Was 2011 an exceptional year in history? It's 2018 and it all sounds the same. Good read. Yes, a lot has happened over the past year. Interesting read. It's hard to keep on a positive note with all that has transpired this past year. It's hard to think of all the people who have suffered and are continuing to do so. Caring for each other as we move ahead will be so important. I entered into 2011 knowing it was going to be a great year, was I ever amazed at all the hardships and devastation suffered by so many in 2011. May 2012 be a much better year in all regards. 2011 was certainly a big year in terms of natural disasters and world unrest. For me it was a hard year and now ending on some good things. So I am looking forward to '12 with good expectations. Good article...much to think about. Australia recently had an election (13th Sept 2013) and the winner, in theory, is the top dog in Australia. But he isn't. Bankruptcy is a rather common place event in the business world. A country nearly going bankrupt, well, that is another thing altogether. Since 2011, Iceland's economy has risen. The British system is based on the sovereignty of parliament under a constitutional monarch.